A few weeks ago I wondered into The Pursuit, at the edge of the quickly gentrifying H Street corridor, just as they were about to close. I had a (great) flight and made a mental note to return for brunch. This weekend a few girlfriends and I went, the first to have a seat when doors opened at 11. I wanted a mimosa, but something different, and The Pursuit delivered. Their pomosas – bubbly mixed with a pomegranate concoction made in-house – was great…and bottomless. It was light, not too sweet like mimosas can be sometimes and a perfect companion to my build-your-own breakfast sandwich – scrambled eggs, sausage, and pepper jack cheese on a croissant. I couldn’t let National Doughnut Day pass without trying my hand at this pairing. After searching far and wide for doughnuts on the evening of this important national observance, I found some glazed and powdered options at my local grocery store, where I also came across this $5 bottle of Lindeman’s Chardonnay. The folks over at eatocracy suggest that donuts should be paired with a sweet sparkling wine. For me, that’s sweetness overload, so I went with this mild, very slightly citrus-y Chardonnay from Australia. The pairing wasn’t my favorite, but it worked. National Burger Day, a day made just for me. I couldn’t decide if I’d make a burger at home, grab a burger from Smashburger (my fave) or get fancy with it at a restaurant. After much research, we ended up at Central in Downtown DC, a favorite of ours. I celebrated the day with their only burger, medium-well, topped with bacon and a spicy mustard. It was simple, and delicious. Is a Great Palate God Given, Learned or Bought? Lettie Teague, wine columnist for the Wall Street Journal, recently interviewed researchers, collectors and reviewers to find out how we develop our palate. (Spoiler alert) While it doesn’t give a definitive answer, it made me feel better to know that my efforts to learn more about wine and refine my palate aren’t completely in vain. What do you think? Is a great palate God-given, learned or bought? Was reading about New York’s “Wine Region of the Year” designation from Wine Enthusiast and thought I should try a bottle. 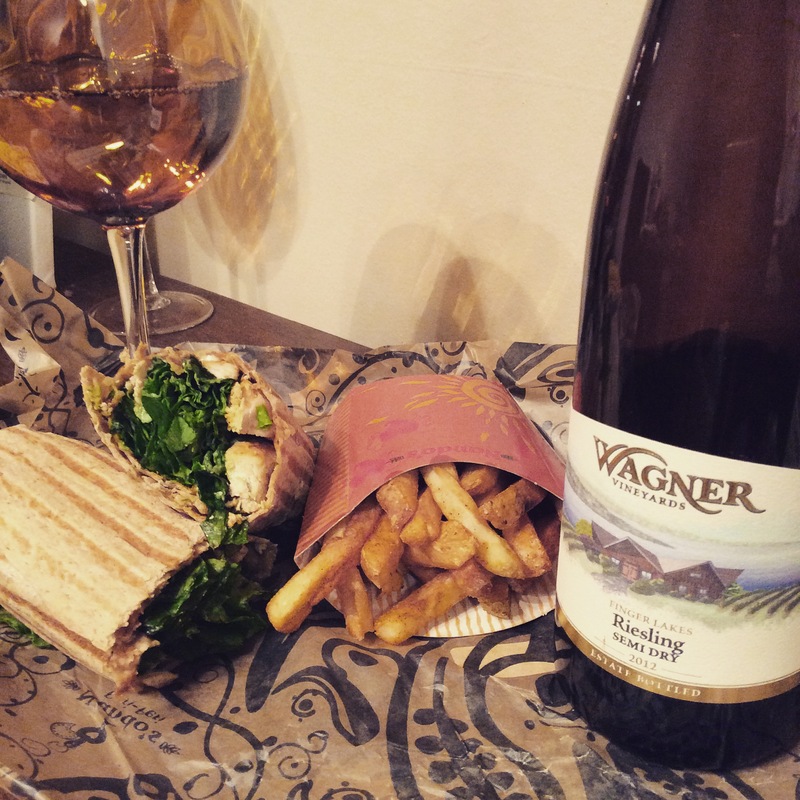 Grabbed this Wagner Vineyards’ 2012 Riesling and a chicken wrap from Nando’s Peri-Peri. The wine is a bit sweet, but mellows out the more you drink. They say Riesling can pair with just about anything, and that rings true for Wagner’s offering. It went well with the grilled chicken I ended up picking out of the wrap. I also paired this with chicken nuggets from Chick-Fil-A the following day and it was just as agreeable. 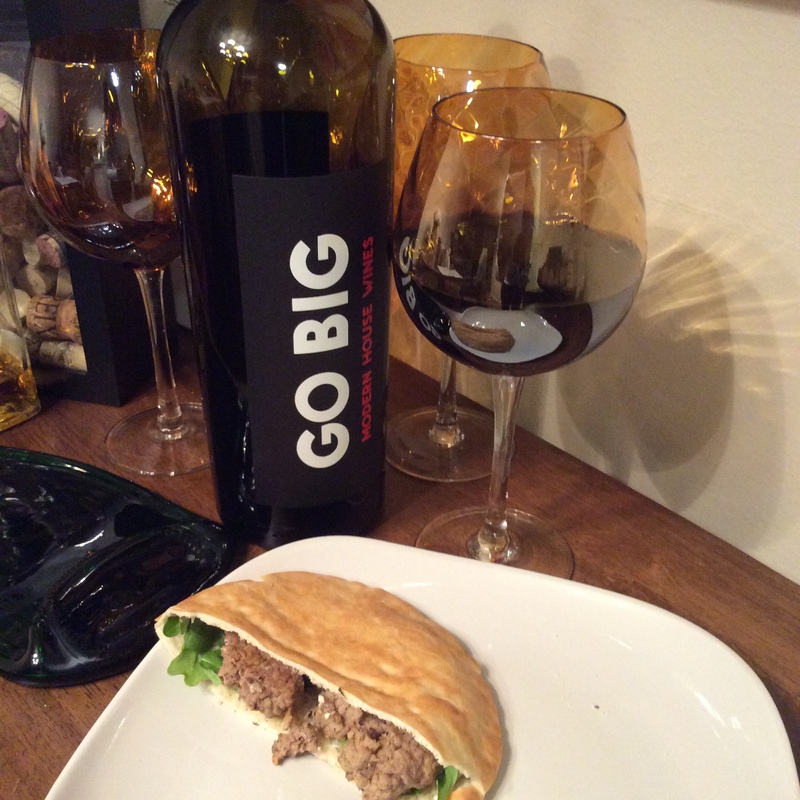 For a blog called burger & wines, it sure took me a while to drink some wine with a burger, huh? The cinnamon-y, mulled wine flavors of Go Big went very well with the Moroccan spices in the burger. I can see this pairing might become a regular.